Little has changed at Lumaha'i beach since the movie South Pacific was filmed in 1957. Located on Kaua`i's north shore, just past the community of Hanalei, Lumaha`i beach is cherished by locals and appreciated by thousands of visitors who pause along the roadway to view this scenic jewel. Although privately owned for many generations, Lumaha`i has long been used by the public, particularly in summer months. Its value, both to residents' quality of life and to the economic health of the tourist industry, is immeasurable. 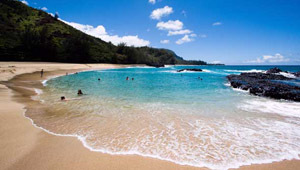 In 2001, The Trust for Public Land purchased 40 acres of land, including the famed beach, from its longtime private owners, protecting public access to the beach and Kaua'i''s fragile coastline. The property is now owned by the state of Hawai`i and designated a scenic coastal reserve.